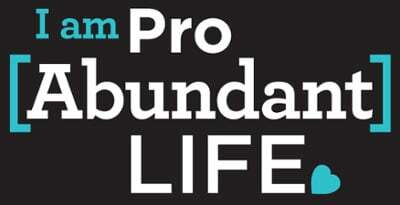 What Does it Mean to Be Pro [Abundant] Life? We all know what it means to be pro-life. And Care Net certainly knows how important it is to save the lives of precious unborn babies -- we've saved over 677,000 in the last ten years. But in God's design there is more to the story. We are not called to only be pro-life, but to be pro abundant life. In John10:10, Christ says,"The thief comes only to steal and kill and destroy. I came that they may have life and have it abundantly." 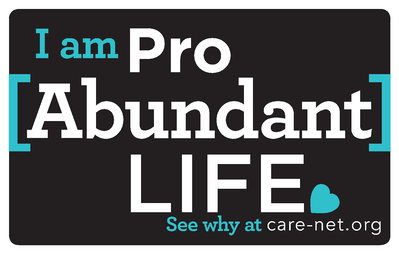 So, what does it mean to be pro abundant life? Pro-life is scoring a touchdown -- it's good and we should celebrate it. But how do we win the whole game? Saving lives for this world is critically important. But saving lives for eternity is the most important thing we can do. Additionally, true and lasting transformation of those involved in making pregnancy decisions (moms, dads, family, friends) comes only through a transformative relationship with Jesus Christ. As pro abundant life people, we will celebrate and encourage efforts to help mothers and fathers making pregnancy decisions come to transformative relationships with Jesus Christ. It is one thing to save a baby. It is another thing to raise a child. And marriage is the God-ordained institution that provides children with the best chance to have an abundant life as God desires. Consider the birth of Jesus. God not only provided his Son with a mother (Mary), but with an earthly father, too (Joseph). God could have fulfilled his purpose by having his Son born to a single mother. But it would have violated his principle for how He wants children to come into the world. So, he sent an angel to Joseph calling him to be a husband to Mary and a father to the child growing inside of her. As pro abundant life people, we will celebrate and encourage marriage, whenever possible for those facing unplanned pregnancies, as the ideal environment to raise thriving children. 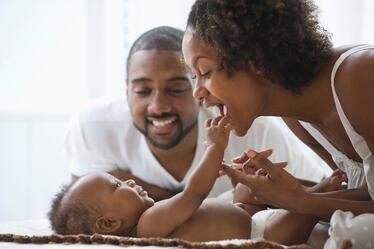 Fathers are often forgotten in the abortion discussion. But they are considered by pregnant women to be the most influential factor in her decision to keep or abort her child. And fathers also play a critical role in a child's well being. Having fathers involved -- during pregnancy and throughout a child's life -- is essential to providing that child with the best chance to thrive. As pro abundant life people, we will celebrate and encourage father involvement during pregnancy decisions and throughout the lives of the children who need them. Legal and political advocacy plays a critical role in saving lives. But hearts must also be changed. If Roe v. Wade was overturned tomorrow, there would still be unplanned pregnancies and sadly, unwanted babies. Are we willing to walk alongside those facing unplanned pregnancies by offering material, financial, emotional, and spiritual support? Remember, life decisions need life support. Also, are we prepared to open our hearts, lives, and homes (through options such as adoption) to the babies and children that need us? Watch Care Net president Roland C. Warren at Family Research Council's ProLifeCon explain what it means to "overturn Roe v. Wade in our hearts". As pro abundant life people, we will minister to women and men facing pregnancy decisions, open our hearts to all of God's children, and dedicate ourselves to eliminating the desire for abortion, regardless of what the law says. Making Life Disciples is Care Net's one-of-a-kind curriculum to equip the church to start a pregnancy care ministry -- a ministry to provide compassion, hope, help, and discipleship to women and men faced with pregnancy decisions. Care Net's national survey of women who have had abortions and their views of the church. Find a Pregnancy Center tool - Find a pregnancy center near you with a zip code search tool. Fatherhood Research - Research and statistics from National Fatherhood Initiative on the unique, irreplaceable contributions fathers make to child well-being. Marriage Research - Research from the National Marriage Project at University of Virginia on the benefits of marriage to women, men, and children.